Folio 7v of the Book of Kells, with an image of the Virgin and Child. Circa AD 800. It is a quiet Christmas night where I am writing: candles have been lit and extinguished, presents have been unwrapped, a simple Christmas Eve meal has been enjoyed and maybe someone has sung a carol at some point… Speaking for all of us at Peter Sommer Travels, I hope that our readers – whether they celebrate Christmas or not – are enjoying a time of love and togetherness, of belonging and joy. 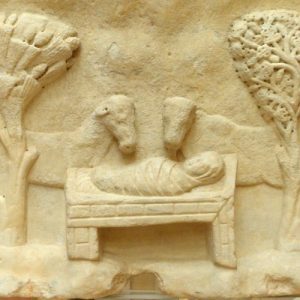 Two years ago, I used the annual Christmas posting on this blog as an opportunity to present some beautiful and interesting Early Christian and Byzantine depictions of the nativity, the very event Christmas celebrates. 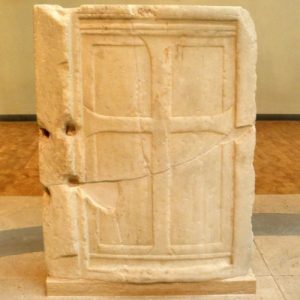 That post offered a short summary of the history of a key motif, covering about a thousand years by drawing from frescoes and mosaics we encounter at various places on our tours in Greece, Turkey and Italy. Thus, it seemed fitting to show you some equivalent images from another complex of Christian art, one that is part of the narrative on the new tours we run in new countries: that of the Early Medieval “Celtic” Church which arose in Ireland and Britain in the second half of the first millennium AD. Especially on our Exploring Ireland tour, we encounter many remains of this tradition: early monastic ruins, soaring “High Crosses” carved of stone, a treasury of ecclesiastical metalwork – much of it unbelievably fine – in Dublin’s National Museum and the famous illuminated manuscripts in Trinity College. Delving deep into this rich tradition, I have found – drum roll – very little! The Virgin and Child from folio v7. To be fair, what I can present includes one of the most iconic and most wonderful images created in Early Medieval Ireland, but it turns out that the era’s imagery mostly focused on other biblical stories: the crucifixion and resurrection as focal narrative, accompanied by various other scenes from the Gospels and the Old Testament. Perhaps the most striking image in all of Irish art is folio 7v of the Book of Kells. Dating to about AD 800, the book, comprising the Four Gospels in Latin, is often considered the most valuable object in Ireland. It is an extraordinary piece of work, almost certainly produced by several scribes and illustrators in one of the period’s most important monasteries, perhaps Kells in County Meath or Iona in Scotland. The quality of the lettering, the extraordinary wealth and playfulness of ornaments and figures drawn around and between the lines and the precision of draughtsmanship all make the Book of Kells a unique treasure, as do the ten full-page illustrations or miniatures. One of them is folio 7v, the page preceding the Gospel of Matthew. It depicts the richly robed Virgin Mary seated with the infant Jesus in her lap, surrounded by four angels and framed by extravagant ornamental interlace patterns, so intricate that they are hard to perceive properly with the naked eye (Trinity College has made high-resolution scans available online). Not quite a nativity, the central image itself is direct and clear, stressing the bond between mother and child: Mary’s face is not serene or joyful, but seems to reflect her foreknowledge of her son’s mission and his sufferings. The apparent naivety of the image, the simplicity of its elements and the awkwardness of the drawing style belies the extraordinary details abounding all over it. While the Book of Kells Virgin and Child is the earliest such image in Western Art, its concentration and seriousness and even composition make it strikingly similar to Byzantine icons of the same era – I cannot prove this by any means, but in my opinion the artist must have been somewhat familiar with Eastern Christian art of his time. Adoration of the Magi on Muiredach’s Cross at Monasterboice, Co. Meath. Probably about AD 900. Among the Early Medieval illuminated “insular” manuscripts, that is those of Ireland and Britain, the Kells 7v Virgin and Child are utterly alone. When such books are illustrated, they are more likely to include other gospel scenes, as mentioned above, or portraits of the four Evangelists. In parallel to the illuminated manuscripts, 9th and 10th century Ireland also developed a tradition of monumental religious sculpture, something totally new to the island and indeed to most of western Europe. In Ireland, the main specimens of this new form of art are the famous stone “High Crosses”, often believed to be descended from now invisible wooden predecessors. We will revisit them on this blog before long. Many high crosses include multiple panels of carved narrative scenes, nearly always of biblical nature.The carvings are exceedingly simple, and while ornamental motifs sometimes approach a sense of depth, the figural scenes tend to remain rather two-dimensional, perhaps reflecting their derivation from book illustrations. It is possible that they were painted once, but today they charm us with their simple cartoon-like imagery, rendering complex narratives through minimalist art, reducing each tale to an emblematic essence. Flight to Egypt on the High Cross at Moone, Co. Kildare. Probably 9th century AD. 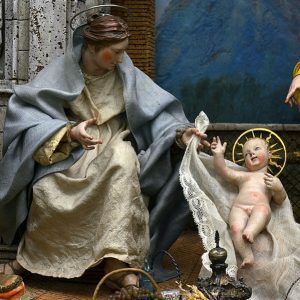 That said, scenes to do with the birth of Christ are exceedingly rare. I can think of only two clear examples. The stunning Cross of Muiredach at Monasterboice, County Louth, features a scene that is usually considered to show the adoration of the magi, although it shows four adorants rather than the usual three. At Moone in County Kildare, one of the earliest and tallest of the High Crosses we know bears a wonderful image of the “Flight to Egypt”, showing the entire Holy Family: Joseph leading a donkey, on which is seated Mary, cradling the baby in her (invisible) arms. Maybe it is not the highest achievement of European sculpture, but as a short-hand narrative it is just wonderful. You can see the Book of Kells (but not necessary folio 7v), the High Crosses of Monasterboice and the High Cross of Moone on our Exploring Ireland tour, along with many other fascinating things and places. For now, let me wish all of you a very happy Christmas, with all the peace and all the love it should bring.